Shopping for Doctor Who Statues? Big Chief Studios presents one of the most accurate scaled reproductions of the Eleventh Doctor's TARDIS! With its ability to travel in space and time, and on occasion to other dimensions, the most remarkable characteristic of the TARDIS is that its interior is much larger than it appears from the outside. BIG Chief's artists studied all available reference and were given access to the actual shooting prop to ensure that this TARDIS is an exact replica in every detail. 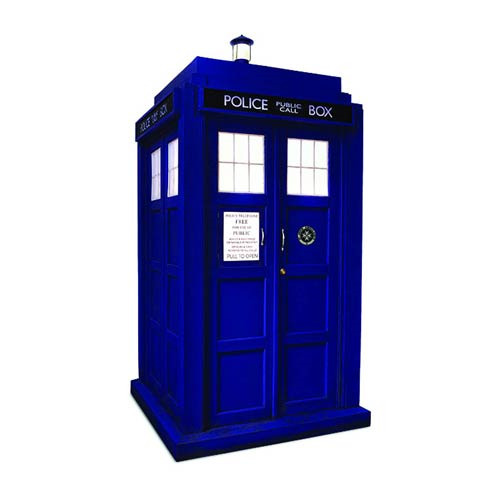 Produced in sturdy, heavy weight polystone, the TARDIS has an internal illumination system, a multi-function light-up lantern, an opening door, and series (season) 5 and 7 control room backdrops. The rooftop is removable to access the battery compartment. The Doctor Who 11th Doctor TARDIS 1:6 Scale Diorama Statue measures approximately 20-inches tall x 10-inches wide x 10-inches long. Requires 3x "AA" batteries (not included). Ages 13 and up.